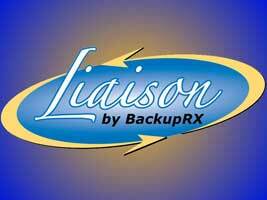 The Liaison : A Failover and Disaster Recovery Solution for Your Enterprise. Failover server to replace any failed machine! The Liaison system is a data backup and multi-server Failover solution perfect for storage, data archiving, and disaster recovery for multiple systems across multiple sites. The Liaison server is installed in your local area network and is configured to act as a virtual replacement server for any machine in your network. Data from all the virtualized servers can be configured to store locally on Liaison or to a SAN or NAS device. Backup data from any source is transferred via our Liaison Client software to the Liaison Server, including remote locations via VPN connection or over the Internet. In the event of a data loss on a protected machine data can be restored quickly over the LAN from the Liaison server. If a server should fail completely a virtual machine may be started from the Liaison that will take the place of the affected computer quickly, and have access to the latest data stored on the Liaison system. Liaison client software is installed on each computer to be protected. The software encrypts and compresses the data at the source and transmits it to the Liaison server. Liaison stores and updates the data to maintain current copies, plus archival versions, of all your vital electronic records. The number of versions kept is completely configurable. Data retrieval is done from either the client program on the source computer or from a web console on any computer, anywhere. The Liaison backup system is completely automatic greatly decreasing the time needed to backup and restore the files you have selected to keep. Virtualized servers are started by your local IT technician or can be remotely started by BackupRx, on demand. Liaison stores the data locally for quick retrieval, and forwards a copy of the data to our secure, remote bunker in Pulaski, Tennessee for safekeeping. All of the traffic to the Liaison server is transmitted using SSL security. Give us a call today and see how the cost-effective Liaison can save you valuable time and resources when you need data back in a hurry. Need more info? Check out our Liaison Users Guide and Informational Flyer.